"The trouble is that we always define 'forward' as moving in our direction...But not everyone can, and not everyone should." I've been reading Thomas H.Cook's novels for some time now, but it seems to me that his previous two books The Crime of Julian Wells and Sandrine's Case marked a serious departure from his earlier works. 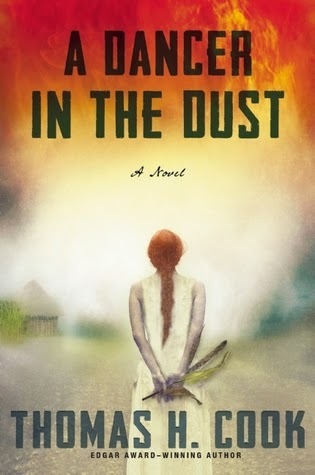 Now he's back again, taking his writing in yet another direction with A Dancer in the Dust, which I seriously debated for a while as to whether or not it's truly crime fiction or something else entirely. In the long run, I decided to post here, since there is most definitely a crime that lies at the heart of this book, but in many ways it's much more of a timely novel set in a very risk-fraught part of the world that most of us will probably never experience. It's a story of great loss and one man's chance at personal redemption, and it is very, very good. In New York City, risk-assessment consultant Ray Campbell picks up a phone call one day, and on the other end is someone from his past. The topic of the conversation is the murder of someone Ray once knew "from the old days," when he was an idealistic younger man with no interest in politics hoping to make a difference in the world -- more specifically, in the African country of Lubanda. Campbell arranges to see the caller, Bill Hammond, who Ray also knew "from the old days," to talk about the murder of Seso Alaya. Alaya, it seems, had phoned Hammond earlier in the week, to tell him he had something to show him, but never told Hammond exactly what it was. Before Hammond and he could get together, Seso was murdered. When a certain clue is revealed to Campbell, he realizes that Seso, who had probably scraped together every penny he made at his job in Lubanda to come to New York, was there about another person Bill and Ray had known in Africa, Martine Aubert, a white woman who was also a native Lubandan and who stood firm against changes being forced upon her. Hammond is now the head of the Mansfield Trust, an organization that is a "kind of a holding company for a large number of charitable institutions and NGOs," that makes recommendations on whether "billions in aid might or might not pour into any particularly country" (and whose decisions are closely followed by highly-placed politicians, and other important sources of funding). The Trust is "poised to offer a great deal of aid to Lubanda," and, as Hammond notes, if they give the green light, then lots of other organizations will follow suit. He needs to know what Seso wanted him to see, so he tasks Ray with getting to the bottom of things. Ray agrees, and in the process of helping Hammond, memories of Lubanda come flying back, especially those of his "Dancer in the Dust," Martine. His search will also bring him back there physically, not only on Hammond's behalf, but also to face down his own demons about what happened there a long time ago.
" 'The nomads will come to this well...and because of the water, they will have bigger herds. But to and from the well, these larger herds will eat more of the grassland, and so the nomads will have to move farther and farther from the well to feed their animals.' She drew a second, wider circle around the x. 'The grasses will be eaten clean first here.' She drew a third, still larger circle. 'Then here.' Now a much larger circle. 'Then here.' She looked at Bill. 'All their cows will die within the first circle.' She handed Bill back the pencil, her gaze now fixed on him intently. 'When that happens the nomads will have nothing to trade for the grains and materials they need. No meat or milk. Nothing to sustain them...but your water...You are friends of Lubanda, but even so, it is important to know the consequences of what you do.' "
Aid also ends up in goods that are stockpiled and sold on the black market or in other venues, and when a country's leader gets rich off of that, there's always someone who's envious of the generated wealth and wants it for himself. And the cycle continues, often starting wars, or bringing to power tyrannical leaders who care nothing for the people of the country, but for how much profit there is to be made in receiving outside assistance. While the author acknowledges that there are genuinely good people with honest intentions of making a difference, there is always a cost of some sort to be paid by those they are trying to help. Martine hopes to show Ray that everything is "more connected to other things." Another big theme in this novel is the way in which foreigners with money push for change in these countries, "to buy what they sell and to make what they, these 'others,' want to buy," and that outside money that promotes change often leads to a form of slavery, begging, or at the very least, upsets the traditional order of things. As Martine notes in this book, "Lubandans should be Lubandans;" if there are tribal rivalries, let them be just that. Another theme that the author hits on in this book is the issue of racial justification; there are other powerful elements that come into play as well, but sadly, space and time limitations do not fully allow me to do this book justice. "...there is none deeper, nor more fraught with peril, than to believe that your world, your values, your sense of comfort and achievement, should be someone else's too." Actually, this is a concept I believe in wholeheartedly, so the book was quite powerful, resonating with me on a very personal level. All in all, A Dancer in the Dust is a very serious, sad, and tragic story, with no warm fuzzies of any sort. It should provide its readers with a great deal of food for thought based on the issues the author presents here. While there is a good mystery to be had here, the novel definitely does not fall within the typical mystery category, and frankly, that's okay by me. I love when authors use their writing to take on big issues. I have only a very small niggle here. Ray's job as a risk-assessment consultant leads him to make certain platitudes throughout the novel about the lessons of risk. For a while, these little rules were okay, fit in well into what the author was trying to illustrate, and I really understand why the author allowed him to do this, but after a while, the continuing referrals to risk assessment started getting old. This, I realize, is a really nit-picky kind of thing that may not bother anyone else, but it did me. Otherwise, every time I had to put this book aside, I couldn't wait to get back to it. It's like I knew something terrible was going to happen but couldn't stop reading until I discovered exactly what it was. And why. So far, reader reviews of this novel have been generally positive, and I will add my vote to the accolades. If you are at all interested in the topic, you should not miss this one. I promise it will keep you turning pages.